It's Time For Leg Day And A History Lesson! An obscure but crazy-impressive record may get broken this weekend. Mark it by watching this historical video and crushing a solid leg workout! 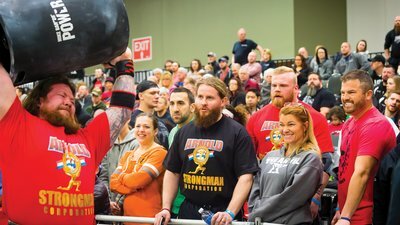 The Arnold Strongman Classic is fast becoming a marquee event at the annual Arnold Sports Festival in Columbus, Ohio, each March. But behind the bright lights of this battle of the monsters, a more low-key but equally impressive event takes place annually: The Rogue Record Breakers, which lasts just 90 minutes on Sunday. This year, the most unique lift at the event will be undertaken by Latvian-American strongman Martins Licis, who will attempt to break a nearly 100-year-old record on a unique lift you've likely never tried: the Steinborn squat. To perform a Steinborn squat, you first stand a loaded barbell on its side, then tip it over onto your shoulders, going directly into the bottom squat position. Easy? Uh, nope. But as Licis wrote on Instagram after doing an easy rep with 500 pounds in the Rogue factory in Columbus, "This actually feels like yoga, it's wonderful." On Sunday, Licis will attempt to break Milo Steinborn's 550-pound squat record from all the way back in 1920. Judging by how easy 500 looked, I wouldn't bet against him. Want to learn more about Steinborn, his squat, and about the history of squatting in general? Watch our History of the Squat video from the Squat Every Day 4-Week Muscle-Building Trainer on Bodybuilding.com All Access. If that makes you want to go a-Steinborning…don't. Instead, set your own standard of strength in this squat-and-chest routine from Day 1 of Squat Every Day. Close-stance, no belt. 8-10 sets. 3 sets. Rest as little as possible between sets.